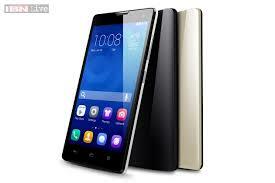 Te new modem from the Chinese developer Huawei, called Honor 6 Plus is coming to India very soon. The official date of the premiere is March 24, and it will be exclusive for Flipkart. When it comes to the smartphone itself it has a 5.5-inch 1080p touchscreen, dual 8 MP main cameras, an 8 MP secondary. Inside there is a HiSilicon Kirin 925 chipset, which comes with an octa-core CPU that has four Cortex-A15 cores and four Cortex-A7 ones. The phone has 3GB of RAM, 16GB of storage, and microSD card support. It runs Android 4.4.2 KitKat underneath Huawei's Emotion UI 3.0. However there is still no price for this model, it might be the same as for China country where it costs about INR 20,000. Sim-unlock.net offers special unlock codes, which allow all Huawei models to work in any network you wish. If you are tired of using the same network all the time please give us a try.